The Incredibles serves up a spicy mix of super hero lore and James Bond adventure. But it’s the social commentary, yes, social commentary, that sets this Pixar film a nudge above the rest. Times are tough and cynical in Metroville and it’s hard for a super hero to get credit where credit’s due. That’s the world faced by Mr. Incredible, the super alter ego of citizen Bob Parr (Craig T. Nelson, Poltergeist), an oversized man of action who winds up on the wrong side of a law suit after a man whose life he saved sues him. After all, Mr. Incredible didn’t save the suicidal man’s life, he ruined his death. With that, a spate of lawsuits put super heroes on notice and basically put the kibosh on the hero business. And so it is, 15 years later, we find Bob Parr married to Helen, formerly the incredible Elastigirl (Holly Hunter, O Brother Where Art Thou?). Together, living under the protection of the super hero relocation program, they have a nice house in suburbia, three children, and Bob drives a beater to a suffocating office job in the insurance industry. Bored with the hum-drum life of suburbia, Bob sneaks out for bowling nights with his old friend Lucius Best, who put the deep freeze on the bad guys back in the glory days as Frozone (Samuel L. Jackson, Pulp Fiction). “Bowling” for Bob has since become a euphemism for covertly righting wrongs in a world where being a super hero has become criminal. Bob’s nocturnal activities pay off in the long run as he catches the eye of the stunning Mirage (Elizabeth Peña, The Waterdance). Soon enough, he finds himself at the center of an incredible adventure that ultimately requires the incredible help of his incredible family. The storyline of The Incredibles is too good to be written off as just the stuff of a children’s movie. 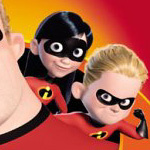 Following the tradition of sophisticated humor and whimsy found in other digital marvels like Pixar’s own Toy Story movies and Dreamworks’ Shrek flicks, The Incredibles is the kind of animated fare that’s great for adults, who’ll be able to drag their children (hardly kicking and screaming) to marvel at what unfolds. What sets The Incredibles apart and makes it, well, incredible, is its sweetly sugar-coated criticism of America’s suburbs today. Ignore it if you prefer, but The Incredibles makes a marvelous commentary on how children are raised today (all the more juicy considering The Incredibles is being distributed by that bastion of all things kid-friendly, Disney). As for Dash, the kid makes that has-been DC comic book hero The Flash look like a tortoise; the boy can bolt. But he sure can’t shine in school competitions; Bob and Helen prefer that he hold himself back rather than do what he was meant to do. Oh. And the villain of the piece is the dastardly Syndrome (Jason Lee, Almost Famous), who hunts down and knocks off heroes in hiding as part of a nefarious plot to create havoc and set himself up as the next super hero. Some might say that reeks of current events. Set the subtext aside and what’s left is a lot of fun. Michael Giacchino, who has created scores for video games and the TV series Alias, provides a horn-heavy score of such brassy bravura it’s more Bond than James Bond. There’s also plenty of pure super hero shtick, including over-the-top villains such as the incendiary French evil-doer, Bomb Voyage, and colorful supporting characters like that munchkin fashion designer to the comic book stars, Edna ‘E’ Mode. Granted, the animation lacks some of the eye candy that made the two Shrek movies the cinematic equivalent of sugar shock, but it works for the material. And that material calls to mind some of the cheesy fun of Saturday morning cartoons, back when Saturday mornings were all about the cartoons. 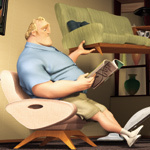 The Incredibles is the brainchild of Brad Bird, who filled the silver screen with his animated The Iron Giant and also directed episodes of TV’s The Simpsons. With The Incredibles he has no doubt kicked off the next big Hollywood franchise, one that has the potential of matching James Bond’s historic celluloid career and the Simpsons’ bottomless source of material. Buzz Lightyear, that gung-ho space hero from Toy Story, is so yesterday. The future belongs to Parr, Bob Parr.